It’s quite apparent that design and art come in pretty much every form and shape. Since we don’t want to limit ourselves to paper, we are always trying to create art on whatever surface we have available. Sometimes it’s on a napkin and sometimes it’s even on the thin transparent air that goes back and forth into our lungs. The canvas can be just about anything when you think about it, and their are many different kinds of software available to us. So what should we use? Which one is possibly the best one for my way of doing art? Well, you have to answer that question yourself cause the way you master a software might be the only way to measure the best software for your designer needs. That’s exactly what an Imgur designer did, and he or she chose… Excel. Yeah, that sounds like an unlikely software to start creating artwork in, but with it comes a few pros that can’t be overlooked. First of all, you can be absolutely sure that when you are done with your work everyone will take notice. After all, it’s made in Excel. 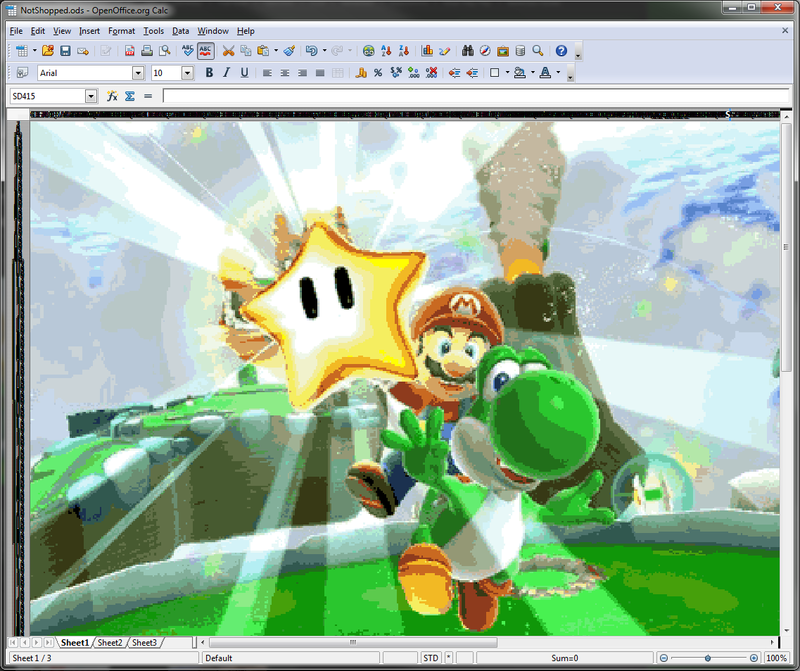 This Super Mario fan artwork is created entirely in Excel, supposedly, and by the look of it, there are quite a few rows and columns used to create each and every single pixel. My question is, of course, how long did it take to create? But there is a slight concern for its authenticity. If I were to do something like this and wanted it to look this good, I would have used a macro that first scanned the picture picking up each and every pixel and color and then macro it in to the Excel document pixel by pixel adjusting the cells as they go through the image. It’s simple, fast and it wouldn’t take a lifetime to do it. So, of course, you start to wonder if that’s the way this image is done. But if not, then the designer should have all the props in the world. Really, ALL the props!